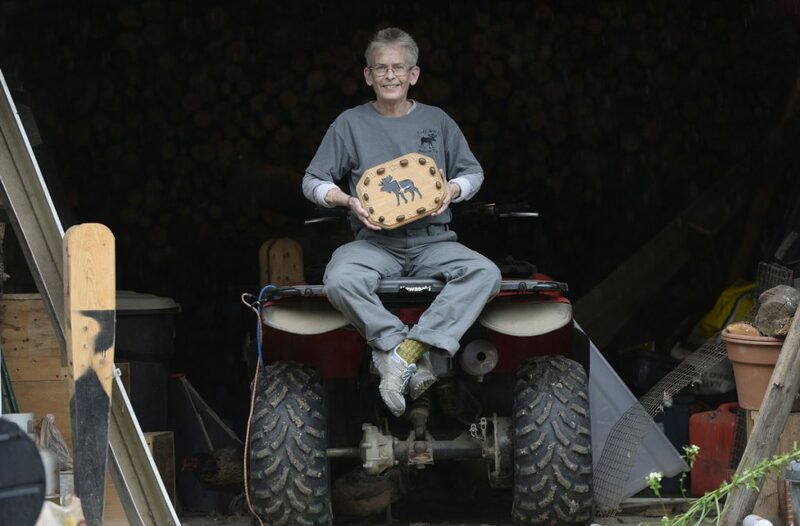 Mary Winchenbach of Somerville has taken on a load of work since an admirer posted a video of her at the Common Ground Fair. SOMERVILLE — The world must need moose turds right now. 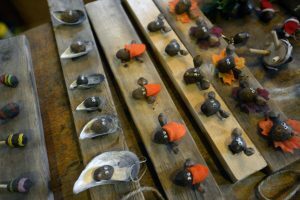 Since a video of Mary Winchenbach peddling her moose-turd art at the Common Ground Fair went viral three weeks ago, Winchenbach and her homespun wares have been featured on television and radio across the country and as far away as Ireland. The video of Winchenbach has been viewed more than 3.3 million times since it was posted Sept. 21 on Facebook. And now she is struggling to keep up with more than 2,000 orders for the moose-turd art through her business, Tirdy Works. Just days after the fair, Winchenbach took a two-week leave of absence from her job at a seaweed plant to keep up with orders. She hired a lawyer to help navigate her growing business, and hired her sister-in-law, Rachel Morse, to manage the website and interviews. On Friday, Winchenbach quit her job at Ocean Organics to devote herself to the turds full time. Art made from moose droppings is not unique. It is sold in gift stores in Alaska, the only state with a larger moose population than Maine’s. Winchenbach first hawked her moose-turd art back in 2005. She started making it because she loves a good laugh – and providing one. “I had way too much time on my hands and one day when I was in the woods, I found a pile of turds and jokingly thought, ‘How funny would it be to put eyeballs on it and call it a (expletive) head?’ So I did,” she said. When Winchenbach met her partner, Deb Nicholls, they started making moose-turd art together until they adopted their three children and had little time for the turds. Then, this year with their children older, they made a bit of turd art inventory. On a whim they rented a booth at the Unity fair. Moose droppings – which look remarkably like stale malted milk balls – can be used as fertilizer, just like cow or horse manure, because moose are vegetarians. In addition, Winchenbach and Nicholls dehydrate the turds and coat them twice with polyurethane, so the turds are safe to handle and clean enough to hang on your walls, your Christmas tree, even your earlobes. 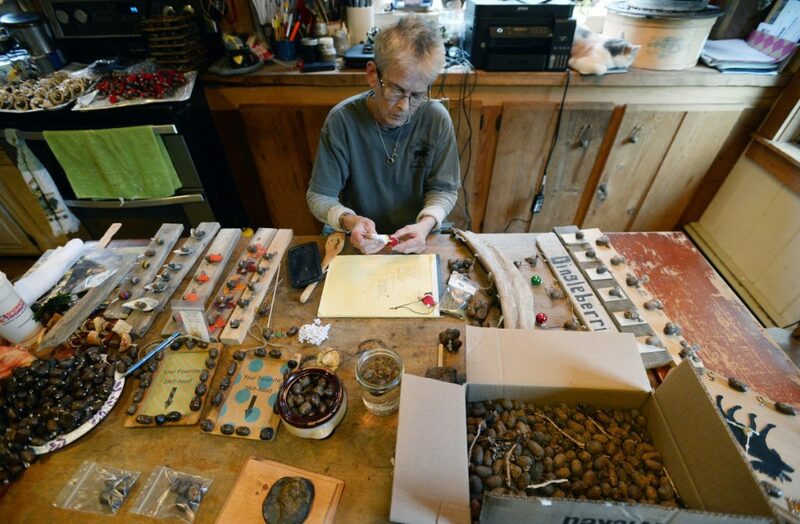 “Deb has started making some pretty moose-turd earrings,” Winchenbach said. She collects the turds on her and Nicholls’ 2 acres, and also where they find them near a local bog. Winchenbach doesn’t find handling the turds to be a dirty job. She said they’re all fiber and as organic as seaweed. Among Mary Winchenbach’s offerings are magnets and ornaments, and moose-turd earrings. Since the Common Ground Fair, Winchenbach and Nicholls have been working 12-hour days making moose-turd products to ship to customers as far away as Russia, Greece and Denmark. The most popular item is their “poopoo clock” (which has turds placed between the numbers to indicate “one-turdy, two-turdy” and so on). Winchenbach wouldn’t say how much revenue they’ve brought in since the video went viral. But she said hundreds of orders sent to the Tirdy Works Facebook page and Etsy page are on back order. Tirdy Works sold out of the 50 logo T-shirts in four hours. Tirdy Works gifts cost from $6 for a Moose Tird Keychain or $7 for the Santa Tird ornament to $45 for the poo-poo clocks. Winchenbach’s favorite is her Santa Turd, dressed in a Santa Claus hat, that is made with googly eyes. Mary Winchenbach makes moose turd art in her kitchen. She recently quit her job to keep up with orders. “When you put them eyeballs on them turds, they get their own little personalities, God bless them,” she said. On the Tirdy Works Facebook page, hundreds of others from across the country thanked Winchenbach for the laughs, the smiles and, best of all, the silly distraction. Carol Richard of Clinton, Tennessee, the woman who posted the video that started it all, said Winchenbach’s presentation at the Common Ground Fair was an uncommon stand-up routine. Within days, the video had 1 million views. “It kind of blew up,” said Richard, a Maine native. And yet Richard thinks what has made Winchenbach a worldwide phenomenon has little to do with the turds.